[A]lthough much has been written about the “Rose Red City, half as old as time”, nothing quite prepares you for what awaits you at this extraordinary place. Petra has to be seen to be believed. 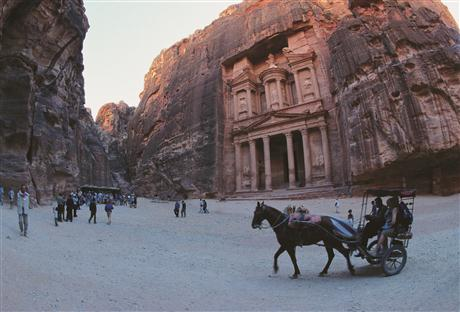 Justifiably one of the New 7 Wonders, it is simply Jordan’s most valuable treasure and greatest tourist attraction. It is a vast, unique city, carved into the sheer rock face by the Nabataeans, an industrious Arab people who settled here more than 2000 years ago, turning it into an important junction for the silk, spice and other trade routes that linked China, India and southern Arabia with Egypt, Syria, Greece and Rome. [P]etra was only rediscovered in 1812 by the Swiss explorer, Johann Burckhardt and much of its appeal comes from its spectacular setting deep inside a narrow desert gorge or siq. The siq is over one kilometre in length and is flanked on either side by soaring, 80 metre high cliffs. For many visitors, just walking through the siq is an experience in itself. The colours and formations of the rocks are amazing. [A]s you reach the end of the Siq you will catch your first glimpse of Al-Khazneh, better known as the Treasury, which came to the attention of millions in the 1989 film, Indiana Jones and The Last Crusade. It is an awe-inspiring sight. The Treasury is a massive façade, 43 metres high and 30 metres wide, carved out of the sheer, dusky pink rock-face and dwarfing everything around it. It was carved in the early 1st century as the tomb of an important Nabataean king and represents the engineering genius of these ancient people. [I]f you look closely, you will even discover inscriptions carved into the stone. You will be truly astonished just confronted by the Treasury at the end of the siq and this is just the beginning. The hundreds of buildings, temples, baths and facades constructed by the Nabateans and the Romans could keep you in Petra for days. But if your visit is brief, try to visit the impressive Ad-Deir Monastery, high above Petra, overlooking the valley. A testing walk of nearly a thousand rock cut steps takes you there. Within the site there are also two excellent museums; the Petra Archaeological Museum, and the Petra Nabataean Museum both of which represent finds from excavations in the Petra region and an insight into Petra’s colourful past. [W]hen visiting Petra be sure to wear comfortable walking shoes and a hat to protect you from the sun and always carry plenty of drinking water. You will surely be caught up in the magic of this wondrous place and walk further and longer than you anticipated. The best time to see Petra, especially if you’re planning to take photographs, is either early to mid-morning or late afternoon, when the angled sun highlights and enhances the amazing natural colours of the rocks.